Product #20881 | SKU SA120A | 0.0 (no ratings yet) Thanks for your rating! A stereo power amplifier, used for all recording applications, etc. 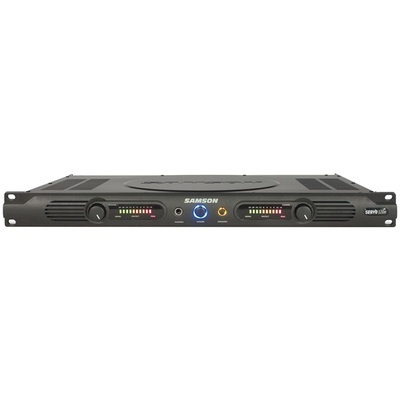 The Samson Servo 120a Power Amplifier is a stereo power amplifier that can be used for all types of recording applications, live performance or permanent installs. The amplifier provides "reference-class" audio performance and reliability in a compact, single rack space package. The Servo 120 utilizes high current output power transistors and features an efficient bipolar circuit design that continuously keeps DC output during idling at or near 0 volts. This keeps idle speakers at their zero point. Thermal and overcurrent protection circuitry is provided, and the amplifier is convection cooled for silent operation, eliminating fan noise and the need for filter maintenance. The Servo 120 provides balanced 1/4" TRS and RCA coaxial inputs and push-spring terminal outputs. Also included is a front-panel protection light, a headphone output, a speaker on/off switch, and 3-color LED meters. 19" x 11 1/2" x 1 3/4"